While most Berliner hope that the strong rise of housing prices since 2009 will come to an end, the top broker agencies, as Zabel and Ziegert report strong demand from foreign, as well as from domestic buyers. The shortage in flats and the growing demand for space in combination with historical low interest rates (both for loans, as well as for alternative investments, in combination with a tendency for fear of inflation) fuels the market. But right now the prices for plots and empty houses, the basic resource needed in order to produce residential space are growing faster than the prices for new constructed flats. The problem of Berlin is that only in a few districts the rents are that high that new constructions make sense. Even the local municipality owned housing cooperatives admit that they need round about 9â‚¬/month/sqm net cold rent (without side costs) in order to produce new constructed multi-family-housing break-even. 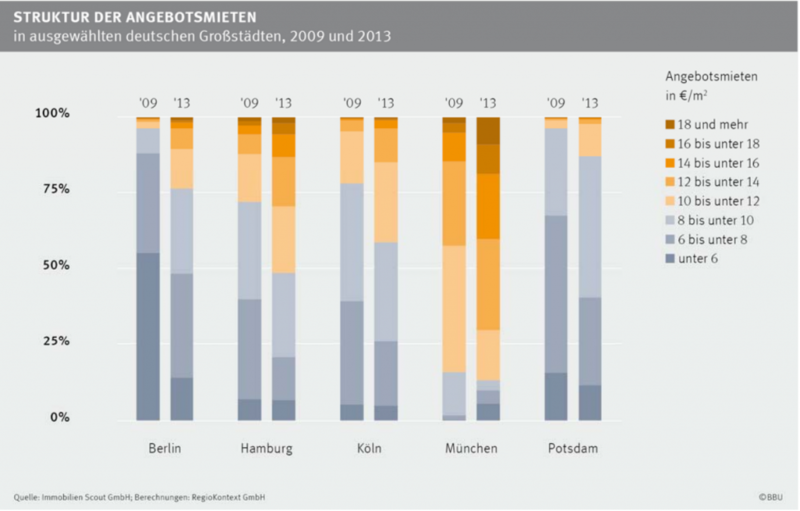 This is only the case for about 25% of all rental offers in Berlin, as stated by the BBU Marktmonitor 2014. In this areas (were new construction makes financially sense) supply of plots is very limited, if not non existing. Berlin still does have a lot of unbuilt plots in the city but the rents there are to low to justify new construction, which typically needs a price tag above 3000 â‚¬/sqm. On one hand we can understand the politicians that want to save the tenants from increasing rents, but we should treat people equal, says Alexander Korte of AMLT Group, a Berlin based residential developer. Why does a new relocated household have to pay 2-3 times more rent than a household who lives here since ages. That sounds highly unfair to me. Please take into account that those household typically have well payed jobs in the strong technology and start-up sector in Berlin, and therefor not only pay more tax, but bring money in the city via consumption and public fees (In Germany fees for public goods, as kindergarden are linked to the income. Taken into account that the preservation of rents is exactly the number one parameter that keeps developers from building the strongly needed housing, the strong legal tools just introduced to minimize rental growth is exactly the wrong medicine. The paradox is that the politicians keep rents low and therefore increase the problem. New housing doesn’t make sense in most Berlin areas, so new supply is nor planed, neither executed. Here we need higher rents that developer start to build in this areas. As demand grows and supply stays limited the rents have to rise, and they will find a way to rise. Talk to an senior property manager and he will tell you what happened when in the 1960ties the rents were artificially frozen by the government. Landlords started to collect money on the side. s.th. like this will happen again. Since years the output in new housing in Berlin is on a historical low of around 3500 units per year, this is less than in Munich (1,4 Mio inhabitants) or Hamburg (1,7 Mio). Experts see a number of 19.000 new units per year in Berlin needed to cover the demand. In the end investors in income producing rental property, who typically take much less risk as developers will benefit from the low new output. Rents will rise no matter which legal frame wants to tie them, and tenants will stay tenants, rather than become economical thinking and retirement planning real estate owners, because they hope and believe that politics can and will fight the market logic. But in the end nobody is helped. Is this really what politicians want? What do you think? Please comment.